On Wednesday, I drove down to Oklahoma City to hear an artist's talk by Petah Coyne, a very prominent contemporary artist from NYC. The talk was held at Untitled[ArtSpace], where they will be exhibiting Modern Materials, the art quilt exhibit I'm curating for next summer. Petah gave a delightful and insightful talk that made me realize that I don't necessarily think like some artists do. When Petah was a younger artist, she had a compulsion for collecting dead fish and she used them to festoon the rafters of her NYC loft. After her husband developed an allergic sensitivity to them, she used the 5,000 fish to decorate other places instead. At one point, she discovered a charming home in Long Island and, in the middle of the night, strung lines through the trees outside the front door of the house, then hung a large number of the dead fish on the lines. She was so hurt the next day when the homeowner came outside and reacted negatively to the fish that decorated his front yard. To Petah, the fish were a great gift and she couldn't understand why the homeowner didn't love them the same way she did. As I have never collected dead fish or even decorated with one of them, I suspect that the left side of my brain must have a bigger hold on me than my artwork would suggest. After the lecture, an extremely nice woman named Michi Susan took me out to dinner in The Paseo Art District, where she has a studio. She creates beautiful collaged artwork using paper. Not only did she pay for my food (I probably ate 95% of the calories between the two of us), but she also listened quite graciously to my incessant babbling. Afterward, we returned to the gallery and spent the night, along with Laura Warriner (the gallery founder) in the second floor bedrooms. What an amazing, art-filled place! The next morning, we gathered up another woman and the four of us ate breakfast at a Guatamalan restaurant. The biggest surprise there was the way they prepared oatmeal. Imagine milk soup that has some oatmeal floating around in it. It was surpringly tasty, however. After breakfast, we returned to the gallery and I had a planning session for Modern Materials with Laura, Jon Burris, (Executive Director), Jan Evans (Program Coordinator) and Autumn Daves (Development/PR Coordinator). We managed to get a lot done and, to help them with their work on the exhibit, I gave Jan and Autumn a couple of the cows that had wandered through the gallery model a while back. I hope that the cows bring them good luck and that the staff can save them from any future alien abductions. You may have seen them here before, but not since they've been professionally photographed. Here are my four newest artworks. The first one is Miscalculated. I had this one dreamed up quite a while ago and the sketch for it is embarrassingly simple. I had intended for it to be a lot smaller than what it ended up being, which is 63" x 52", because I wanted to make this for an exhibit called A Sense of Humor. However, there was a very specific size range specified and I just couldn't make this fit those parameters. Oh well. After I posted this on my website, a friend wrote and made the comment that Miscalculated was a word that represented something singularly human, while many of my past works represented physical things. That made me realize that, for the past few years, it had been easier to deal with things than with emotions. I think I'm ready to change that. The second is Convoluted. When installed, it's about 15" h x 18" w x 18" d.,about the same size as Discombobulated. This is the fourth quilt of this type I've created and in some ways, I wish they would go away because they are a pain to arrange properly, but they have also become my signature, bread-and-butter pieces. I made this one particularly colorful and gave it a black binding in order to make the colors pop even more. The third is Picniced. Originally a joint project with two other people, I made new items to replace the ones they reclaimed after the exhibit was over. I am particularly proud of my BLT sandwich, which is entirely made of fiber materials, and my dill pickle, which is made of a lightweight modeling clay. My photographer happened to shoot it with the groundcloth propped up on the back of the backdrop so you could see the stream scene. Last week, I was looking at this picture and realized the genius of what he had done. I now plan to add a hanging sleeve at the stream end of the quilt and hang it low on the wall when it is displayed. That way, the picnicers can see the scene a lot better when they are eating their clay pickle and Tyvek bacon. The last is Collapsed. I had this displayed in my solo exhibit last Fall, so it's not really a new piece. Leftovers from Collapsed went into Miscalculated and Convoluted, which is why the color schemes are almost the same. Although it's hard to see in this picture, there are six legs attached to the base. I suppose I could have used shorter legs, but I wanted this to be a freestanding work that didn't require a pedestal. It had to be tall enough so people wouldn't trip over it in an exhibit. Last week, I travelled to South Carolina and spent a couple of days visiting my 92 year old mother. She doesn't look her age, but I'm not surprised because she's always looked like she was 15 years younger than she really was. Oh, I just love the whole idea of "inherited traits". My mother is deep in the throes of Alzheimers and there are some days that doesn't speak at all, but some of her personality is still leaking out around the edges. Just as I was getting ready to leave, I reminded her who I was and told her I loved her, but was about to go. Very slowly, she said, "I would like to live... the rest of my life... in the land of Jill". I love you too, Mom. 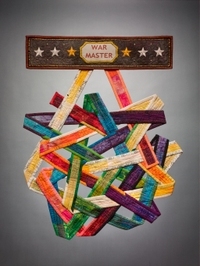 After leaving the nursing home, I drove to Columbia, SC and attended the opening of Cyber Fyber, a very interesting exhibit of fiber art that was curated by Susan Lenz. Her whole idea was to demonstrate the connections that she has made with other artists on the internet and the influences they have had on her art and her life. In one part of the exhibit, there were small artworks the size of postcards and trading cards, mounted by the hundreds upon the walls. They were created by artists from all over the world. In the side room, there were larger artworks made by 19 international artists who Susan had invited. Here is a picture of my artwork, Transformed, in the show. I walked into Gallery 80808/Vista Studios, where the exhibit was installed, about 5 minutes before the reception officially opened. I recognized Susan from pictures I had seen of her, so I went over and introduced myself to her. From then on, she made me feel like a rock star. Susan is an absolute ball of fire and I kept expecting to see sparks flying off her fingertips. Here she is in the middle of the picture, along with her mother and sister, Linda and Sonya. What a great family! They obviously love each other a lot and support each other. Here's another picture of Susan with Stephen Chesley, a painter who has a studio there. He's helped Susan quite a lot with her career. Interestingly, Steve and I are only 5 months apart in age and our fathers worked in the same building in New York City, probably at the same time. How strange is that? I was so impressed with the way that Susan curated this exhibit. It had a central theme that went far beyond "aren't these pretty quilts" and she created 12 different blogs to document everything going on. Here is the main one. She even has a blog filled with videos of the reception and exhibit. In the blog for the invited artists, I love her description of the installation of my work. Another wonderful thing that Susan did was to recruit Cindi Boiter, a professional writer, to produce and distribute press releases. They both did a wonderful job and the show has been reviewed in a number of publications, such as undefined, an excellent arts journal for South Carolina. See p. 30 for the start of the article and P. 31, column 2 for the writeup about me. The day after the reception, Susan planned a Fiber Day at the gallery. Four local vendors came in to demonstrate new materials and machines. The big hit was the Embellisher, which does needle felting. Susan also gave a demonstration of how she makes her own work. All in all, I had a wonderful time and was so impressed with Susan's organizational abilities. She is a great curator and I hope she has the strength and energy to do something like this again someday. I was truly honored to be a part of it. I am glad to have found a great photographer because there is no one in Wichita who is able to produce the same high quality of work. His name is Gordon S. Bernstein and his studio is in Melrose, MA, which is so far away from me that I've only met him once. It's very scary to send my work away to be photographed when I don't have any control over the final product, especially when much of my work is installation art. However, Gordon has always had a top notch stylist and studio assistant working by his side who specializes in the fiber arts. I am sad to report that the stylist, Arnebet, passed away recently after a long illness. The one time I was at the studio, I had the opportunity to meet him and this post is written in his memory. Arnebet was a real macho guy who loved the clothing models who came into the studio and the girls loved him, too. As you can see, he was often caught making out with them when he was not required to be on the set. You can tell he's not gay by where he's looking. One of the great advantages of working with Arnebet was his meticulous attention to detail. In the first picture, he is carefully arranging scarves made by Lisa Micheels and in the second picture, he is checking the proper positioning for my own artwork, Unmatched. Apparently, he tried dialing Misti's phone number that's written inside the matchbook cover but only got a busy signal. Always a stickler for perfection, Arnebet would work tirelessly with the models, demonstrating the pose he wanted them to take. He was very secure in his masculinity so this did not bother him a bit. In the second picture, he is showing Sam how to keep her back straight and her ears at the correct angle. From what I understand, she was never able to get the ear part quite right. Often described as being cute as a bunny, Arnebet was so dedicated to his craft that he was frequently willing to work for nothing more than raisins. He will be sorely missed. For the past several years, a strange pattern has developed in my art career. From January to about August, a lot of things seem to go right for me. I get accepted into juried exhibits, invited to be in invitationals, offered solo shows and so on. Then from the end of the summer until the end of December, it all dries up. I can't seem to find anybody to take my work, even though I've been burning incense and dancing the Exhibit Dance around roaring bonfires like all artists are supposed to do. I don't know why this pattern has been happening, but I think the curse has finally been broken. Today, I received a phone call from the Visual Arts Center of New Jersey. One of my works was accepted into their International Juried Show, which is probably the top all-media exhibit in the U.S. today. The juror, Adelina Vlas, who is the Assistant Curator of Modern and Contemporary Art at the Philadelphia Museum of Art, chose 80 works from 1600 entries and Unmatched was one of them. Now I expect the two sides of my brain will begin fighting as to whether I should attend the opening or not. I have to admit that it's very tempting. This is a general update on some things that have been happening behind the scenes with my art career. If you're not interested in hearing about this kind of stuff, feel free to stop reading now. Really, I don't mind a bit. However, I have to warn you that I've placed some spyware inside your computer and I'll know what you've done. About a week ago, I wrote to the gallery director at a college 35 miles from my house and asked if she was accepting portfolios. Apparently she went out to my website and liked what she saw, because when I returned from taking down my solo show the next morning, I received an email from her asking if I was able to fill her gallery space myself or needed a second person to exhibit along with me. I ate lunch, then drove there to take another look at the gallery and ended up talking with the director. 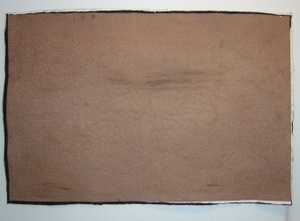 The result was an offer for another solo show, to begin at the end of September, 2009 and continuing through October. Do you know that "letdown" feeling that can happen after finishing a big project? I didn't get to wallow in it after taking down the Newman University show. Gee, I'm almost disappointed. I said almost. My favorite gallery, Untitled[ArtSpace] in Oklahoma City, asked if I would curate a quilt exhibition for them. They even allowed me to put together my "dream" exhibit, which will be an invitational show of 20 artists whose work I most admire. A percentage of the artists also work in 3D like myself, which will help fill up the center of the 10,000 square foot gallery. There will be a catalog and workshops associated with this exhibit and the gallery is interested in travelling it after it finishes its run there. The dates for this exhibit will be July 10 to August 29, 2009. I'm going to be pretty busy around the end of June! Tomorrow (Wednesday), I am leaving for the International Sculpture Conference in Grand Rapids, Michigan. I'll let you know how it went when I return. This is a leap into the unknown for me, but I've never been much of one to shy away from risky things. It's also time I made more contacts outside of the art quilt community and in the larger art world. I didn't make it into the Quilt National exhibit again this year and it may be just as well. I think it's time I acknowledged that my artwork doesn't fit there anymore, but I was hoping to get that particular notch on my belt before I moved on. Unfortunately, there are no pictures with this post. I have some pictures of Picniced now that it's finished, but I already packed the camera and I forgot to download them first. I'm afraid you'll just have to wait. Big oops. Forgive me? Here's a better picture of Posted, the "bulletin board" in my solo exhibit. It looks so real that many people walked right past it, not realizing it was part of the exhibit. Even when they were standing close to it and I told them it was a quilt, bending the bottom upwards to show how flexible it was and how you could see the stitching on the back, some still asked if I used real cork to make it. Nope, it's all made from fabric. I used a combination of thumb tacks, straight pins and push pins to hold the items onto the board. To protect the wall behind it, I covered the points with pierced earring backs. I am sooooo clever! The real bulletin board for the university's art department had some pictures of art that had been cut out from magazines, so I added a picture that I had cut from a magazine, too. You can see "Alien Invasion" by one of my favorite artists, Pam RuBert, right under the Art Dept. sign. The lime green poster in the lower left is the gallery's schedule for the 2008-2009 school year. If you look closely, you can see an arrow to my name, with the handwritten words "Is she related to Mary Werner, the gallery director?" and underneath, "No". This was my way to answer the obvious question, for people who know Mary. The Art Dept. sign is attached with Velcro to make it removable. The next time I use the bulletin board, I can change the sign to suit the situation. Just to the right of it, I placed a fly (glued to a thumb tack) that looks like it's crawling across the surface of the cork. There are also a lot of extra tacks and pins in the board, to make it look like it's being well-used. You'll also see a fortune from a Chinese fortune cookie and some comic strips from my home bulletin board. The white papers are fake notices. One is a "Roommate Wanted" sign, one supposedly has course additions for the Fall semester and the other is a For Sale sign for an Gauguin ($37 million OBO/ Moving out of state). If you have been following my blog for a while, you may remember my blog contest. The three prizes are the blue hand dyed scarf, the artwork in the black oval mat and the round, red, beaded pin just above the scarf. These prizes will be sent to the winners when the exhibit is over. I had a wonderful time at the opening reception for my solo exhibit on Friday evening. Many people turned up with whom I wanted talk longer, but I didn't have the opportunity. Two hours goes pretty fast when you are having fun! If you think we're friends but you didn't turn up, we may have to renegiotiate our relationship. The art may not have drawn you, but how could you resist free food and wine? By coincidence, the gallery director is named Mary Werner. A man and wife with the last name of Werner were also there because he works at the university. To my surprise, another Jill M. Werner turned up with her husband and friends. She lives here in Wichita and we knew each other existed, but had never met. I had sent her an announcement postcard as a lark and she apparently couldn't resist meeting the other Jill M. Werner in town. The first three letters of our middle names are even the same. At one point, there were seven Werners standing in a circle talking and, with the exception of the married pairs, none of us were related. That kind of thing never happened to me when I was simply Jill Rumoshosky. Splashed, which can be seen on the pedestal near the left wall, was most people's favorite piece. Another favorite was Posted, which can be seen on the right. It looks so much like a real cork board that many people were walking past it, thinking that it was a real cork board used by the university's art department. However, if they studied the items on the board, they soon realized that something was a little "off" and it was actually part of the exhibit. I added more bulletin board items after this picture was taken, so I'll take another before I do the gallery talk tomorrow and write a blog post about it. Many thanks to the folks at Newman University for making this exhibition such a success! Last Thursday, I flew to Ohio for the opening reception for Material Matters, an incredible exhibit of art quilts at the Columbus Museum of Art. It turned out to be the largest summer opening this museum has ever had, with over 1000 visitors in attendance. Here's a picture of me standing on the museum steps. There are 39 artists in this exhibit from all over the world, selected from former teachers and students of the Quilt Surface Design Symposium. Considering the extraordinary level of talent represented, I was very honored to be one of the few who had two works invited into this show, Knitted and Transformed. Knitted's image was used for advance publicity and I was one of several artists who was asked to record a cell phone audio tour for my work. If you would like to listen to it, call 614-448-5095 and press 321#. There is also an impressive book available from the museum containing all the works included in the exhibit, as well as a great section written by the guest curators, Linda Fowler and Tracy Rieger. Here are installation pictures of both my artworks from the show. Unfortunately, after taking the first picture of Knitted, I was asked to turn off the flash on my camera, which is why the picture of Transformed is not very good color-wise. I tried to tweak it, but just made it worse, so it is shown here unchanged. One of the best parts of going to such a reception is the opportunity to meet and talk to other artists, the curators and museum staff. A high proportion of the artists attended, including some of my favorite people, Marilyn Henrion and Kathy Weaver. Marilyn and I are in at least four different exhibits right now. An interesting side note is that the museum has a large section dedicated to the great American painter, George Bellows, who was from Columbus. One of his more famous paintings is Lady Jean, a portrait of his daughter. As it turns out, I knew Jean when she was an adult. She lived a couple of blocks from my house in Dobbs Ferry, NY and her family was good friends with our next door neighbors. I was just a little girl at the time, so to me she was always "Mrs. Booth". I do recall going to birthday parties at their house and trick or treating there on Halloween. I know it's been a while since I posted. I've done a lot of thinking about where I'm headed with my art. This started recently when a fiber art group invited me to join them. After about a week, I realized that I wasn't actually creating my artwork anymore. The group was the final straw that took up the last of my "arting" time. I made the decision that I would withdraw from most of the activities that were keeping me from the work I really should be doing, so I sent my "thank you, but I'm not staying" email to the group a few days ago. I also plan to withdraw from a couple of other commitments that are either taking too much of my time or making me feel guilty because I'm not doing them. They are all related to art quilting, which also goes along with my plan to move more into the general art world. I must be rebelling against my responsibilities, because I've spent the past few days sewing the seams on my latest artwork. I've been sewing the color run together and I know what I'm going to do with it, but I'm not telling yet. Last week, I bought a new sewing machine, which is something I thought I'd never do because I have such a good one already. However, after struggling to quilt several of my last projects, I realized my Bernina 1260 wasn't sufficient for all my needs. I intend to keep the Bernina for sewing seams and use the Janome 6600 for machine quilting. Of course, this means I need to rearrange my studio to accomodate another sewing table. If everything goes normally for me, there'll be a cascade effect throughout the entire house and nothing will remain untouched by the time I'm done. The Organizator strikes again. I apologize, but I sent out an incorrect link in my last post. By mistake, I added a "www" in the URL. I have corrected the original blog post, but here's the correct link for any subscribers who tried to get there and couldn't. I know that many of you are experienced quilters and the information I am presenting now might be rather elementary, but I hope you will stick with me. Right now, I'm just laying the groundwork for the information I'll present later. For those of you who have already visited my new blog and even subscribed, thank you! - My work was accepted into two Florida venues for the I-4 Corridor Exhibition. Tangled will be at the Comma Gallery in Orlando and Angled will be exhibited in the Rose Room Gallery at the Peabody Auditorium in Daytona Beach. I don't know the exact dates yet, but it will be sometime in June. - My favorite contemporary art gallery asked if I would be interested in curating a quilt exhibition for them. Of course, I said yes. The artistic programs committee is meeting sometime this month and I'll have more information after that. The list of art quilters I want to invite keeps growing in my head. Thank goodness, it's a large (and wonderful) space! - In the next week or so, I plan to launch another blog. When I began teaching traditional quilting years ago, I was asked to teach a workshop on color and fabric. I didn't choose fabrics using any of the common methods, so I analyzed what I did and came up with a new system that was easy to learn and produced a great quilt every time. At one point, I started writing a book, but never finished because I was no longer teaching or making traditional quilts. This blog will be a great place to record my ideas and it will read like the book I originally envisioned. I will cover both traditional quilting/commercial fabrics and art quilting/hand dyes/surface design work. Right now, I'm setting up the blog's structure and will start adding entries in the next couple of days. I'll let you know when it's ready for visitors. - I've been working on Evolved recently and added a couple of items to Posted, the bulletin board. One of the items I added is a small artwork I created to be one of my contest prizes. In my last post, I wrote about an antique wool quilt that was given to me by Roger Shimomura, the painter. Yesterday, Sara Farley, a quilt historian who lives here in Wichita, came to my house and examined the quilt. She felt the it dated back to at least the early 20th Century and maybe even the late 1800s, but wasn't sure because wool quilts are difficult to date. I gave her the quilt and she is planning to show it to Barbara Brackman, probably the top quilt historian in the U.S., for her opinion. I wrote to Roger today to tell him this information. In a very interesting twist, both Roger and Barbara live in Lawrence, KS just a couple of miles apart and he even knows her. I don't know what will happen to this quilt, but Roger and I agree that it's now in the right hands. Last week, when I attended the Kansas Art Commission artist fellowships reception, I met Roger Shimomura, the world-reknowned painter who received the Master Fellowship in Fine Arts. He told me that he was going to send me an old quilt that he purchased at an auction 25 years ago in Lawrence, KS when he was teaching at the University of Kansas. The quilt had been in a box ever since and I think he wanted to find it a good home. I haven't done anything with traditional quilts in about ten years, but I knew more people in the field than he did, so I told him to send it along and I'd figure out what to do with it. I received the quilt today and discovered it was made from wool fabric and hand pieced. 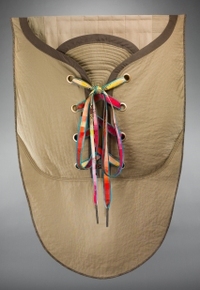 Lines of herringbone embroidery stitches highlight the stitching lines and the outside edge. The blocks are 10" square. 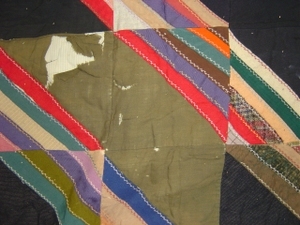 However, you can also see that the quilt is in poor condition and the insides are showing. Blue ticking fabric is peeping through the biggest holes, so I suspect that the quiltmaker used an old coverlet inside as batting. I wouldn't be surprised to learn that this quilt dates back to the 1800s. Since I am not an expert on old wool quilts, I called Sara Reimer Farley, a well-known quilt historian who lives here in Wichita. She will be coming over on Thursday to see it in person. If she wants the quilt, she can take it home with her. A quilt like this is a little piece of history and belongs in the right hands. I'm surprised that no one has guessed the two words that will be at the top of the board. I can tell you right now that it has nothing to do with zoos or animals, other than their mention in the last bulletin board item I posted on my blog (which is something of a pun, considering the artwork's name). I suggest reading the last two bulletin board items again. They have major clues in them. If these two flyers are found together on the same board, where would it likely be located? It would be read by people with similar interestes and I acually passed by two boards just like them on Friday evening. No, they weren't in grocery stores, because I'm far too lazy to shop that much, even for food. Mea culpa, but I don't have another "clue" bulletin item to show you this time. I promise to have one in my next blog entry. I spent several days this past week putting together an exhibit proposal. 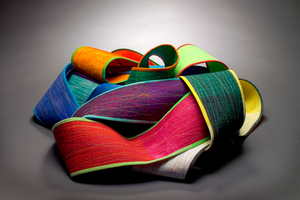 The Surface Design Association has a textile conference every two years in Kansas City, Missouri and many of the galleries there host fiber art exhibits in conjunction with it. KC is only about a 3-1/2 hour drive from me, which is practically next door by Midwest terms, or spitting distance if you're a really good spitter. I know that many talented artists from all over the world will be throwing their hats into the ring for exhibits too, but it's always worth trying. You never know when the Magic Exhibit Fairy is going to bless you and I figured I would get the experience of applying, at the very least. Sigh, I was hoping for a repeat, but I didn't get into Quilt Visions this year. I had entered Laced, Dispensed and Prepackaged. Maybe that bodes well for getting into Quilt National in some finely-tuned karmic balance. As it turns out, I was recently invited to exhibit a piece or two in a show in Texas, and it must be part of that Twilight Zone karmic thing. This was the third invitational exhibit that contacted me within three weeks. I normally get about one every couple of years. I had a short discussion with the Steckline Gallery director about a piece I wanted to put in my solo show. It might be considered a controversial work in Kansas, so I wanted to clear it with her first. I started this project ten years ago and haven't finished it yet, but I think this is going to be the proper time. 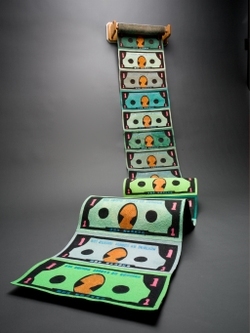 It is an 18-foot long by 12 inches high timeline of the universe, from the Big Bang to current times. It is named Evolved and if I don't finish it in the near future, I am going to have to add a foot or two onto the end to compensate for all the extra time I took to make it. Of course, I have friends who predict the end of the world will happen if I ever finish this, because it's been a work in progress for such a long time. What you are seeing in the picture is the section right after the Big Bang, where galaxies and planets are forming. Right now, this is quilted, but I still need to bind the edges and then embellish the surface. My experience with making Portable Picnic made me realize that my old "picture quilt" skills were worthy of resurrection, if not on a fulltime basis. Speaking of Portable Picnic, it will be coming home in the next week or so and I will need to do something with it since the tableware will be going home to my collaborators. My current plan is to make some new table items myself and rename the work Picnicked. Yes, it's spelled with a "k". I looked it up. I started my next project, but it was stalled for a few days because my sewing machine was in the shop. Heaven help me, I had no more excuses, so I cleaned the toilets. No wonder I quilt, if that's the alternative. I am announcing a contest open to everyone who doesn't already know the answers (and I know who you are). The first blog reader who correctly gives the right answers to each question wins a piece of this artwork. It will be mailed to you, postage paid, around the end of September, as I intend to exhibit this artwork as part of my solo show. There are three questions and the correct answer to each one wins a prize (one prize per person). Leave your guesses as comments on this blog, so they are time-stamped. I will continue to post pictures of this project as it progresses. You can guess the answer to any of the questions at any time. 1. What will the quilt be when it is completed? 2. What is the name for this artwork? 3. There will be some text incorporated into this project. What will it say? To give you an idea of what you are looking at, I painted a fabric with brown acrylic paints, dark streaks and all. I used that fabric (whole cloth) as the quilt top, with layers of Thermore batting and black wool felt as the middle, then used black Kona fabric as the backing. I am stitching it heavily with brown thread. In the picture, this quilting is partially finished. When the quilting is done, I may paint over the entire top again, changing the color. Remember, I use quilted forms as if they are raw material in my artwork, so what do you think this is going to be? At the very least, I'll be trimming the edges clean, but do you think I will cut it up and use it in something wild and crazy or will I keep it the general size and shape it is? Leave your guesses on the comments! In the middle of quilting my latest artwork, my sewing machine told me in no uncertain terms that it was past due for its standard maintenance. That's means I've been without my machine for a few days while it's in the shop. That's fine, because I'm catching up on other, more low priority work, like cleaning toilets and filing paperwork. Recently, I received notice that Melted was accepted into the SAQA: Up in Stitches exhibit at the Yeiser Art Center in Paducah, Kentucky. It will be there from March 8 - May 3. I hope they know that they need to arrange it first or hoo boy, are they in for a shock. Last weekend, I got a call from Shin-Hee Chin, who is an art professor and talented fiber artist. I was in a four-person exhibit with her last year at The Fiber Studio. Shin-Hee is curating an invitational fiber art exhibit for September to be held at the renovated Opera House in McPherson, Kansas, a one-hour drive north of Wichita. She asked if I would display two or three pieces in this show. This happens to be at the same time as my solo show at the Steckline Gallery, which made me worry a little about having enough work to go around. However, I want to restrict my Wichita show to artworks that have never been seen here before, so I told Shin-Hee that I would be glad to show my work in McPherson. I'll just use work that has been previously exhibited in Wichita, making it available for this show. Just in case I have any artwork left during that time, I would also like to enter a juried show that is being organized by my friend, Pam RuBert, which will be exhibited in Springfield, Missouri in September. I think I need to make some new work pretty quickly in order to replenish my stores! This picture of Pam was taken at the opening reception for Quilt National last May. Speaking of new work, I've started a new project and will award prizes to people who can guess correctly about it. The details for the contest will be in my next blog entry, so stay tuned! I found out yesterday that I received a 2008 Mid-Career Artist Fellowship from the Kansas Arts Commission. It's actually not official yet because the KAC board needs to approve the list. However, I find it hard to believe that a majority of the board members would look at the list and say, "Jill Rumoshosky Werner? Oh no, we don't want her to get an award. She's a real creep and we can't stand her artwork. Give that award to someone else." Most of them have no idea who I am, so if they rejected me, it would probably be based on the difficulty factor of my name alone. They might feel it's too long to fit on the 3-foot tall, diamond-encrusted trophy that I'm sure I am going to receive. Since I attended the selection panel meeting and saw the work of all the other visual arts candidates, I know how tough the competition was this year. They had restructured the fellowship rules and many previous winners were allowed to apply again, so there were a lot of candidates and most of them did very good work. I feel privileged to have been one of the eight artists chosen and I intend to be insufferably smug for the next few days. If it gets any longer than that, stage an intervention and slap me in rehab. I secretly added some new artwork to my website after getting it photographed by my excellent photographer, Gordon Bernstein. He makes my work look really, really good. You've seen most of these projects on my blog and followed their progress, so this may not be a surprise to you, but look what he did with Dispensed. Click on the picture to see a larger version or you can see the detail pictures here. Another work I had photographed was Laced. I wrote a lot about it in previous posts so I won't talk about this one either, but here are the detail shots. A smaller piece that I finished recently can be found here. I decided to call it Isolated. I know it's a semi-creepy name, but it seemed appropriate. I guess I've spent too much time in my basement and it's beginning to get to me. Pictures of Portable Picnic, the collaborative project currently in an Oklahoma City gallery, are here. If my part of this project doesn't sell, I'll bring it home, make my own tableware for it and enter it into shows. Last but not least is Awarded. I made most of this two years ago, but it never felt finished. I didn't want to enter it into shows, but I did post pictures of it on my website and publish them in the first version of my brochure. I finally realized what needed to be added and had it rephotographed. I added the "War Master" part and the work finally says what I wanted it to say artistically. I have created several human rights related artworks in the past, but never one as political as this one. However, there is another secret meaning here which I prefer to keep to myself for now. If you know the answer, then you know I consider you a good friend. If you don't know the secret meaning, pump me full of cheap chocolates someday and I might tell you.